The scientists were unable to agree on the reasons for the drop in sea level that was roughly equivalent to a 10 per cent reduction in its surface area between 1930 and 1977. It was decided to close the passage. Work proceeded in February 1980 despite the fact that the level of the Caspian had started to rise again three years earlier. The Soviet engineers apparently assumed it was only a temporary change. 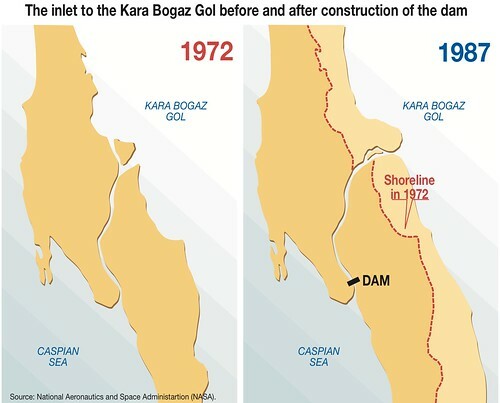 Only a narrow canal was left allowing a small amount of water to pass, thanks to which the water in the Kara Bogaz Gol gulf was expected to last a further 25 years. Much to everyone’s surprise the gulf dried up 10 times faster than had been forecast by the Water Problems Institute and by autumn 1983 it was all over. The pink flamingos died in droves, the little brine shrimp on which they fed having disappeared. The lagoon turned into a vast desert covered with a 50-centimetre layer of precipitated salt, which was picked up by the wind and blown for hundreds of kilometres, as far as the Chernoziem (fertile soil) area of Russia, raising the salt content of the soil. With the closure of the strait, the gulf also stopped acting as a natural hydrological regulation system (keeping the salt content at a relatively low level). The ensuing increase in the salt content of the southern part of the Caspian, to levels exceeding 15 grams per litre, had disastrous consequences for the sturgeon population. In the spring of 1992, in view of the scale of the disaster, Turkmenistan, which had just declared its independence, decided to recover the Kara Bogaz Gol gulf from the desert. It therefore destroyed the dyke, restoring the connection between the sea and the gulf. In the meantime closing the gulf had resulted in the collapse of the salt industry.